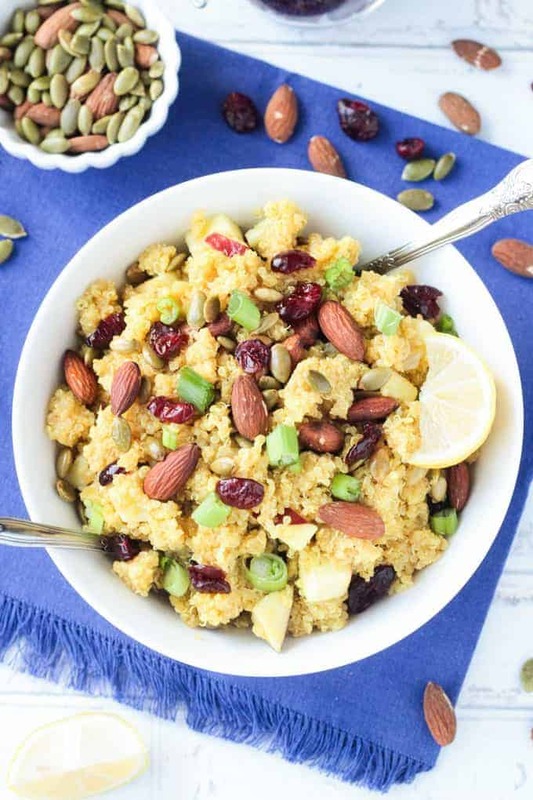 Curry Quinoa Salad Recipe – a quick satisfying salad perfect for a light lunch or dinner. It’s filling, but won’t weigh you down. 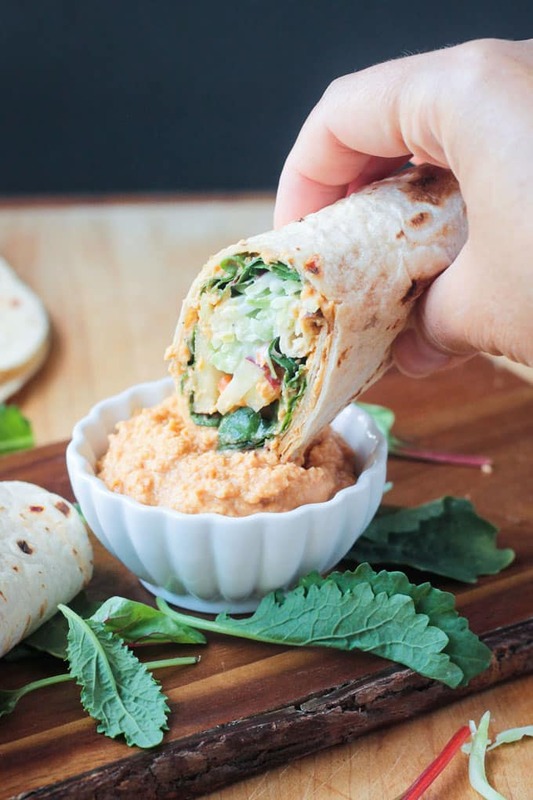 Easy to make ahead and perfectly portable in lunch boxes or toted along to potlucks and parties. Customize it with your favorite fruit, nuts, and seeds to make it your own. 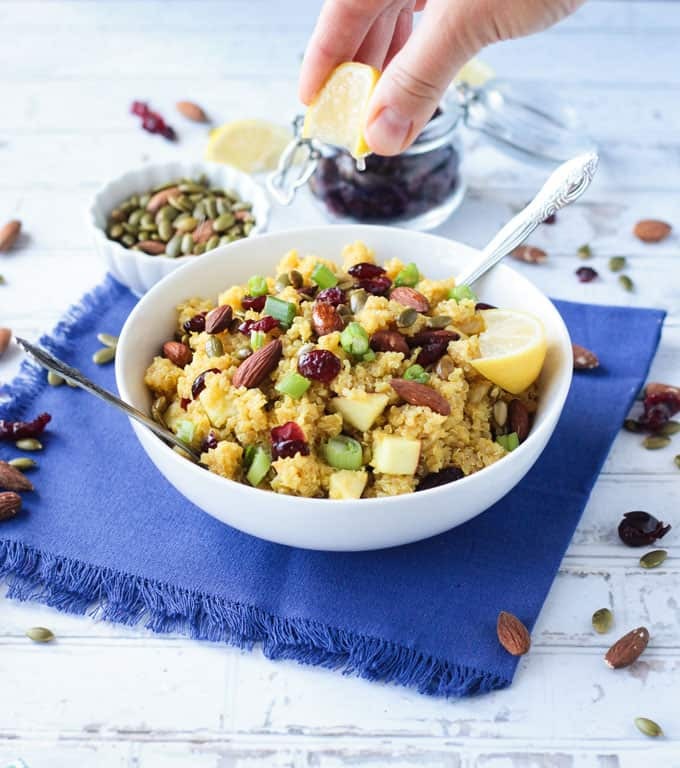 This Curry Quinoa Salad recipe comes from the new book, Vegan Weight Loss Manifesto by Zuzana Fajkusova and Nikki Lefler. Taking control of your health and thriving on a plant based diet is easy with the right tools and this book would be a great addition to your arsenal. It’s not just a cookbook, but an entire “8-week plan to change your mindset, lose weight and thrive.” You’ll find shopping lists, meal plans, fitness schedules, and even suggestions and instructions for lifestyle habits like meditation. If one of your goals in the new year is to get healthy (or healthier) you’ve gotta take a look at this book! Who are Zuzana and Nikki? Zuzana Fajkusova and Nikki Lefler are the founders of the blog, Active Vegetarian. There they share plant based recipes, fitness, nutrition, and lifestyle tips to help people take responsibility for their own health. 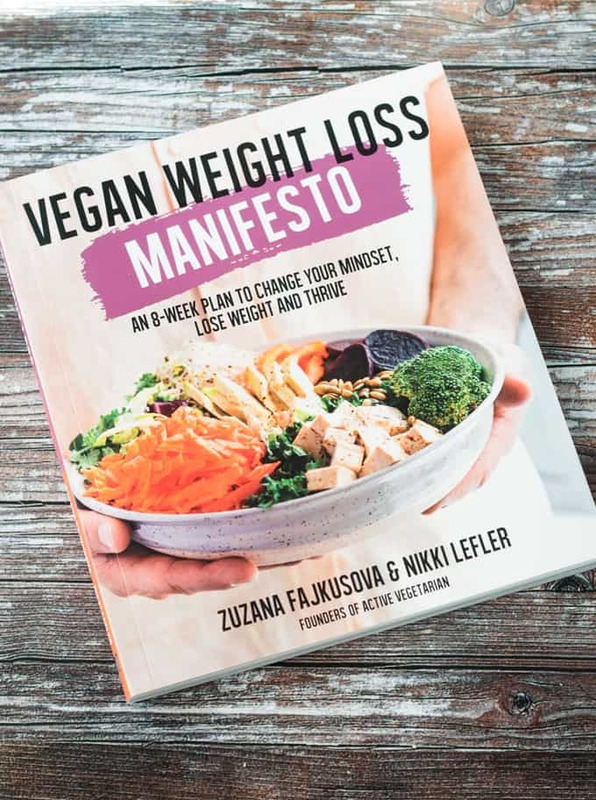 The Vegan Weight Loss Manifesto is their new book that puts it all together, in an easy to understand and apply way, to make living your healthiest life a breeze. Because this book is not just a cookbook, it’s set up a little differently. There are 4 parts broken down into smaller sections to make it easy to find what you’re looking for. 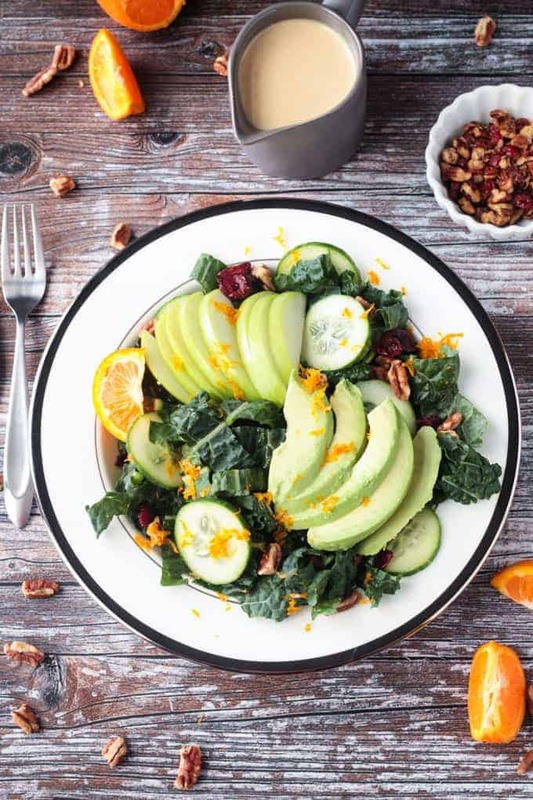 Here you’ll find out if this plan will work for you (spoiler alert – YES, if you put in the work, you will succeed), why they chose plant based, and how to use the book to get the most out of it. This is the part where the weekly nutrtion, fitness, and lifestyle plans come in. It’s broken down into sections by week. Each section (or week) you’ll have clear instructions on what to do, add, or subtract from your life. For example: Out with the Junk, In with the Healthy; Sit Less, Move More; Meal Prep 101; Stress Management; Interval Training Time, and more. Lunch – Roasted Garlic and Red Pepper Sandwich; Tempeh Reuben Sandwich; and the Curry Quinoa Salad recipe that you’ll find at the end of this post! In this part you’ll learn about helpful kitchen tools, what to buy organic (or not), and soaking and sprouting times for beans/nuts/grains. Extra Support – With this book, comes not only everything I’ve already mentioned, but online support from Nikki and Zuzana as well. When you see a web icon in the book, it indicates there is additional support available online in the form of videos, additional meal plans, extra recipes, motivational tips, and more! You will get access to the client-only section of their website to ensure you are successful in your journey. How cool is that?! Who is the Vegan Weight Loss Manifesto For? It’s for anyone who wants to get healthy or healthier. It’s for anyone curious about a plant based diet, but not sure where to start. It’s for anyone who wants to eat more vegetables regardless of your current diet choices. It’s for anyone who wants to start incorporating fitness into their daily/weekly routine. It’s for anyone who wants to have more energy and less stress. 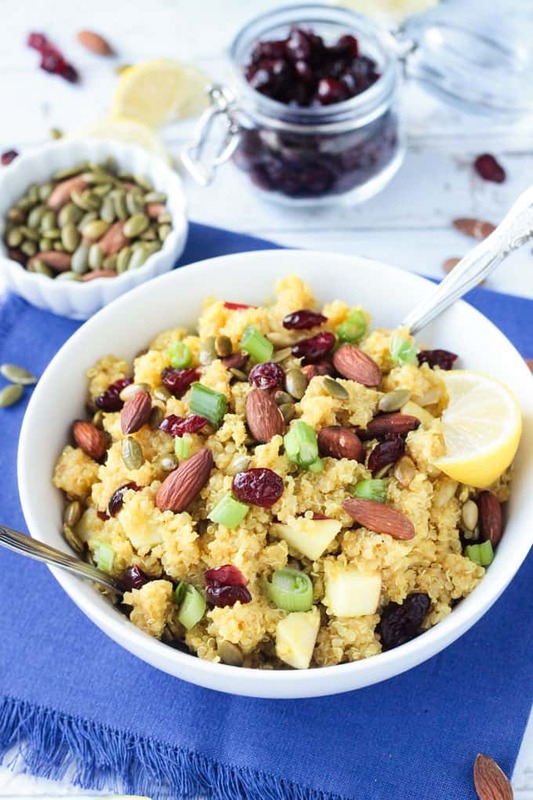 It’s for anyone who wants more delicious healthy recipes like this Curry Quinoa Salad recipe!! I hope you love this Curry Quinoa Salad Recipe as much as I do. If you make it, please leave me a comment below with your feedback and star rating. You can also find me on social media. Be sure to tag @veggie_inspired and #veggieinspired so I’m sure to see it. Enjoy! Be sure to get your copy of the Vegan Weight Loss Manifesto here. Spread the almonds and pumpkin seeds on a baking sheet and bake until lightly toasted and fragrant, about 7 minutes. Let cool before coarsely chopping the nuts. Rinse the quinoa thoroughly and drain. Bring 2 cups (474 ml) of water to a boil in a medium saucepan. Add the quinoa and return to a boil. Stir the quinoa, cover and reduce heat. Simmer until the quinoa is tender but still chewy, about 15 minutes. Fluff the quinoa with a fork; let cool. Whisk together maple syrup, shallot, curry powder, salt and lemon juice in a large bowl. Season with pepper. Whisking constantly, slowly pour the oil in and whisk until the dressing is well combined. Add the quinoa, cranberries, apple, seeds and nuts; toss well. Serve as is or use as a stuffing for collard wraps. ~Note from Veggie Inspired: I opted to add some chopped green onions to the salad as well. The recipe calls for a shallot, but in the pic it looks like there’s green onion? Correct. I added green onions as a garnish – I mention it in the notes section. That recipe looks and sounds delightful! The book looks awesome, too! Thanks, Jennifer. I think you’ll like it! Yum!!! I love quinoa salads! They’re so filling! This one would be a delicious packed lunch! I agree! Let me know if you get a chance to try it. Thanks, Liz! This recipe sounds delicious (I love curry) and I’m sure the whole book is fabulous! I’ve been all about the curry this year! Hope you love it, Lisa! This salad sounds super tasty! 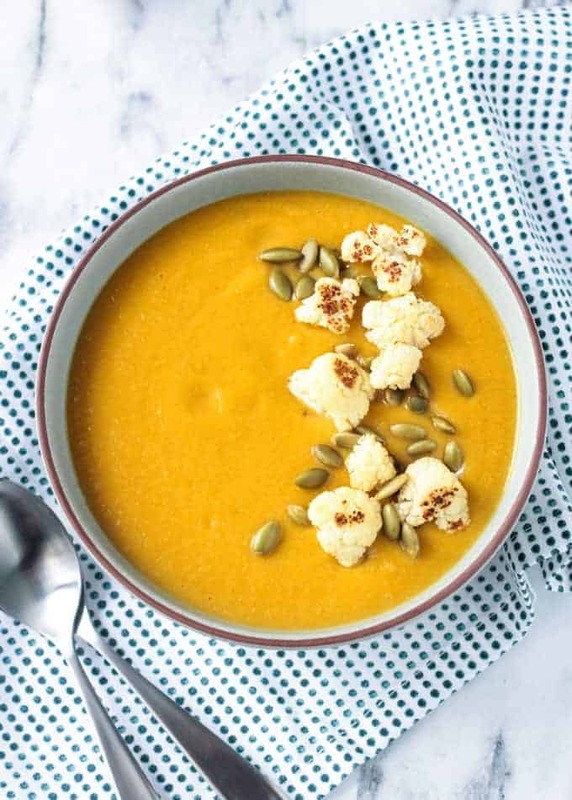 I am not personally vegan, but definitely am always looking for ways to incorporate more plants into our diets and make our everyday meals as healthy as possible, and a lot of the recipes you highlighted from the cookbook really sound delicious! You definitely don’t have to be vegan to enjoy these recipes and the rest of the book! Thanks, Monica! Wow! 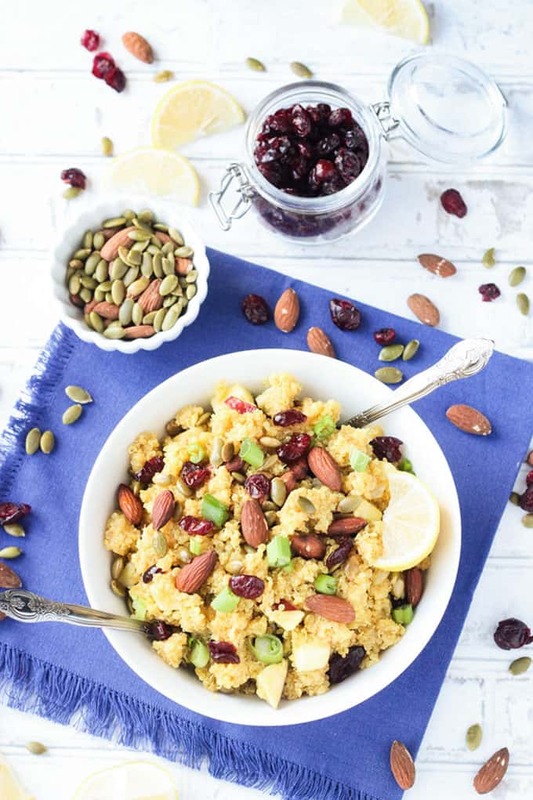 This curry quinoa salad looks yum! So full of goodness and with an Eastern twist. Who would have thought of adding curry powder to a salad? I’ve been obsessed with all things curry this year. Hope you like it, Saima!